Is Jufran Banana Sauce the Next Sriracha? As a kid, I remember when my friend first spied the bottle on my mom’s kitchen shelf. “Fish sauce? !” she exclaimed, her nose wrinkling. "It's not made from fish," I told her (wrongly, by the way—I was eight), "It's to put on fish." Among other foods, as the rest of America would soon find out. 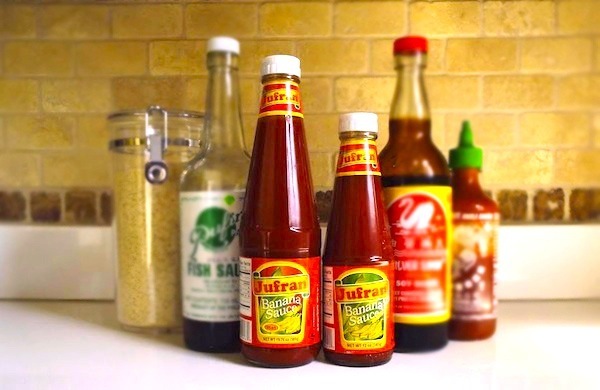 As Southeast Asian food has exploded in popularity in the last 15 years, condiments and seasonings like sriracha, sweet chili sauce, and fish sauce (patis in Tagalog) have come along for the ride. And while my mom used to have to pick up fish sauce at specialty markets, now it can be found next to the Kikkoman soy sauce at almost any supermarket. Concocted during a shortage of tomatoes in the Philippines, it’s literally a ketchup made from a mixture of bananas, vinegar, and spices, which is then dyed red to imitate Heinz’s iconic condiment. Many people call it the condiment of the Philippines, and it’s often a staple on tabletops, next to the patis and toyo (soy sauce). Sweeter and smoother than tomato ketchup, whose brightness is almost citrusy in comparison. It’s not spicy, but it’s got an undercurrent of heat or smokiness to it. What do you put it on? And as mentioned above, the hot version of Jufran has an extra kick that makes it a great spicy-sweet substitute for sriracha.